An Atlas V (Atlas 5) rocket lifts off from pad 41 at Cape Canaveral Air Force Station en route to a geosynchronous orbit to facilitate U.S. military communications in the Middle East. This photo was taken outside FLORIDA TODAY headquarters in what some people would consider Rockledge, Melbourne, Suntree or just unincorporated Brevard County, Fla. Who knows? Again with the streak, I know, I know. 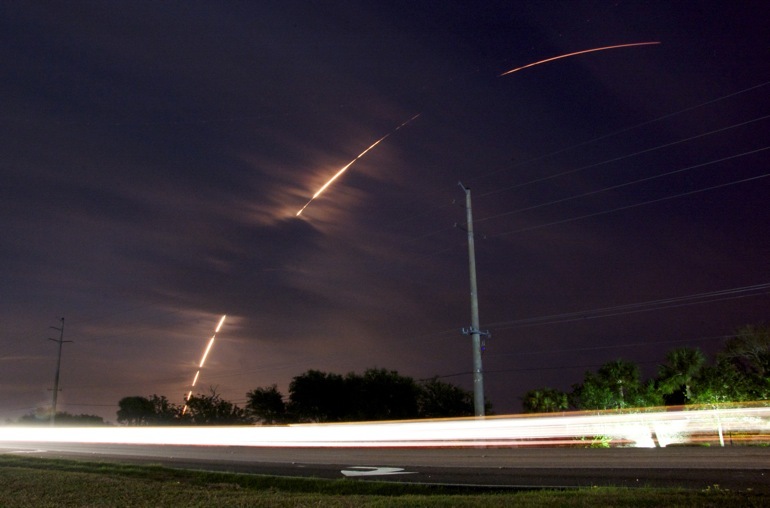 This is the same frame job that has appeared in all of my rocket launch photos from work at FLORIDA TODAY. It's simply my go-to spot along U.S. 1 when I only have minutes to step outside the office and set up my camera for a timed exposure. For this one, I finally mustered the restraint to leave the shutter open, capturing the full arch as the United Launch Alliance Atlas V rocket lifted over the Atlantic Ocean. It was a swift flight, so the exposure was only 113 seconds. To achieve such a photo of an enormous Delta IV Heavy, for example, it might take closer to three minutes. The cloud cover made the flight interesting. The first dark cloud the rocket passed behind was so light-canceling that I thought something had happened to the launch vehicle. This rocket was carrying a communications satellite - part of the Wideband Global SATCOM constellation - that will assist U.S. military efforts in Iraq and Afghanistan. Maybe someday, this thing will spot Osama bin Laden as he tapes another death-to-America YouTube video. Additionally, there's a mirror image of the streak in the left-hand part of the photo. It's faint in the 600-pixel version above, but clearly visible at full size. I ended up with two instead of one parabola in the image. Though my woes could be solved with a trip to the camera repairman, I have determined that I need a new camera. I've been coping with an entry-level Nikon D40 for two years now, and it's high time I got something that the semi-professionals or enthusiasts wouldn't mind being caught dead with. Maybe a D90 or even a D300? Here's to stimulating the economy. Coming up: The next two launches from the Cape are scheduled on my days off. My fingers and toes are crossed for prompt flights - and a good deal on a new camera.